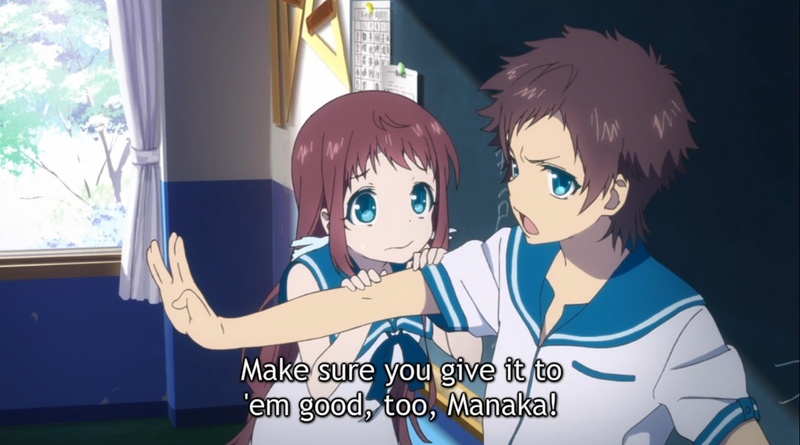 So, it’s the same, I feel for Hikari, he likes Manaka (voiced by Hanazawa Kana! 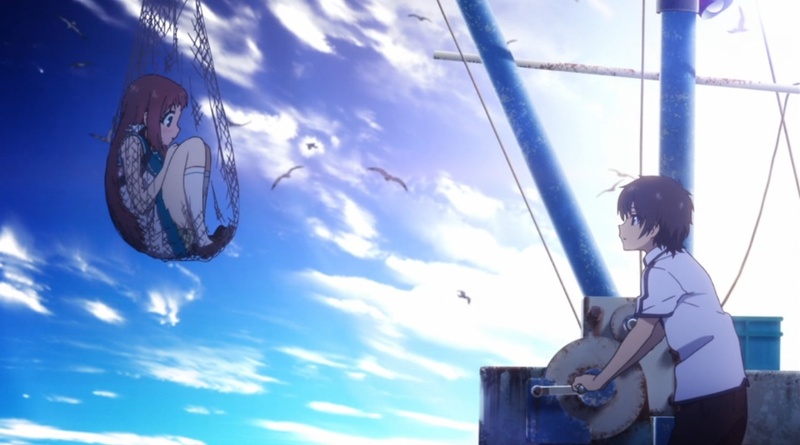 ), his female childhood friend, but the story starts from where Manaka meets the other guy, Tsugumu the fisherboy in a new world. Yes, Hikari and Manaka are like mermaid-humans live under the sea, but come up to the surface and transfer to the new school, and then there, Manaka being fished by Tsugumu, the first special meeting that Hikari describes with a shock. Yes, like Cleopatra rolling out from the carpet, Like Miyazaki’s Laputa, a cute girl falling from the sky. How impressionistic would that be…any guy would fall for that! So, Hikari is threatened by a thought that Tsugumu might one day NTR Manaka. Childhood friend transferred to the new world, and the ultimate symbolism is to change her last name (losing maiden name). Ahhh, but my case, my girls have probably already been NTRed and become wives a long time ago. Yes, legally bound! How sad… That legality that I can never break, because it’s the mighty government that officially recognizes their relationship. Even as a die-hard anarchist, I feel completely powerless before the government, though I have a right to vote and run for office. So, it’s public and official and final. What’s done is done. Nothing can be changed. It’s not like my girl made a new boyfriend, but got a husband! Eternally lost! She moved on to the new world completely that left me behind. So yes, I can identify Hikari’s fear, a sense of losing someone eternally. Ahh, so saudade! Yes, girls move on so quickly and whimsically, as if the good old romantic memory didn’t exist in the first place. So, to me living in a remote place like America, thousands miles away from Japan, and watching anime is like accessing to my memory of adolescence, yes, coming of age. These romantic anime characters always remind me of the girls I loved in high school, yes, or more like that romantic feeling I had in those years. So, anime and moe themselves are already saudade! And this anime is written by awesome Mari Okada, who wrote AnoHana and ToraDora! 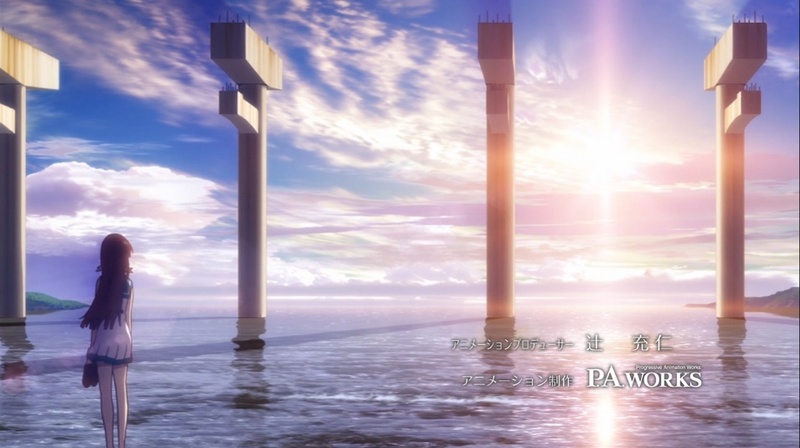 Yes, the OP is sung by Ray, who also sang for the OP of AnoNatsu. Yes, unrequited love, sehnsucht/saudade is beautiful. So, it’s the same feel with Onegai Teacher, AnoNatsu, and now P.A. Work is doing for Nagi No Asukara. Yes, Mari Okada and P.A. Works tie-up since Hanasaku Iroha! Yes, the scenery is so beautiful and awesome! I don’t know yet, it’s too early to say, but I feel that this might become a masterpiece. But I want to know what Gendomike thinks about this anime! He wrote one of the greatest articles in the history of AnimeDiet, That Summer I Waited., and I’m looking forward to his commentary. Just watched the second chapter and I gotta say this really is beautiful but I don’t know if I like it, I feel really bad for Hikari since I can completely relate to those feelings, that frustration and anger when you know your girl is getting NTRd, I don’t like how he’s mean to her but I know it’s not easy to be in that situation. Also Chisaki likes Hikari and Kaname likes Hikari, OMG this is gonna get complicated (O_O). Hahahahaha! Exactly! You are totally my comrade, franz! Yes yes. How sad and frustrating… Yeah he is mean because he is ahhhhhhhhh. So embarrassing! Boy, kekeke. Me too. That is why it’s holding me up from going back to Japan. Coz I still remember the girls I fell in love in high school especially when I was 17! And I’m afraid that what if they are already NTRed and become someone else’s wives. I will have psychological trauma, PTSD. I know this sounds crazy but I’m like hikari forever. Yes forever seventeen. That’s why I feel like I’m personally experiencing this anime! Yeah the picture is just amazing!